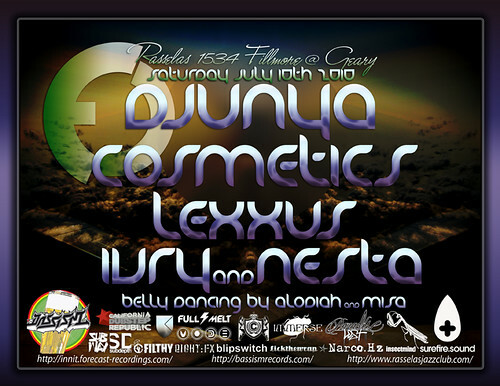 Description: Forecast 003 launch hosted by Bassism head Tommy Lexxus with special guest Djunya. Description: Support the california dubstep republic with their efforts to build a LovEvolution float with this night featuring the sounds of UFO. Description: DNB & Dubstep fusion here with hard hitting sounds from Trillbass & Mark Instinct leading the dubstep side. Description: Bassism records night with Bram Dem! head Sam Supa and support from residents. Description: Bassism records comes with another big monthly with Blipswitch honcho J. Rogers and support. Check out this mix by J. Rogers for a taste.